The Seahawks Tuesday signed DL Sealver Siliga to replace Garrison Smith, consigned to injured reserve. TE Luke Willson’s knee injury apparently has required surgery. The Seahawks Tuesday placed DL Garrison Smith on injured reserve and re-signed DL Sealver Siliga, who joined the club in March as potential replacement for departed free agent Brandon Mebane. He was released in August with an injury settlement (calf). 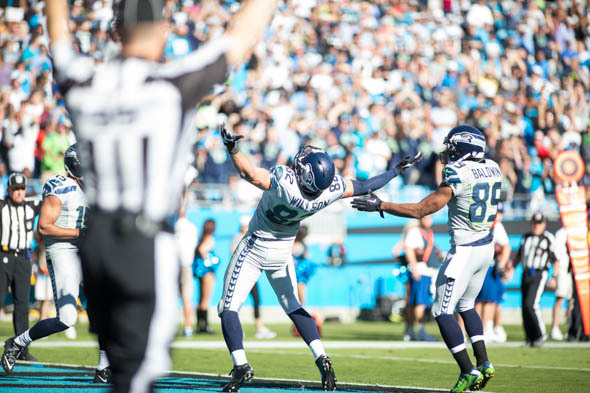 Also, TE Luke Willson, who had a knee injury Sunday, tweeted from his hospital bed Tuesday. Willson did not specify whether he had undergone surgery for cartilage and/or ligament damage, nor did the Seahawks offer an explanation on Tuesday’s off-day for players. Willson was injured on Christian Michael’s touchdown run in the 26-24 win over Atlanta. He had to be helped off the field. In his absence, Brandon Williams, a fifth-year pro from Oregon, likely will be advanced to the No. 2 tight end spot behind starter Jimmy Graham. Williams, 29, a 6-3, 247-pounder, has played mostly special teams and has not caught a pass. He has four career receptions for 44 yards. Siliga signed with the Seahawks as a free agent and they planned to use him as a run stuffer in the Mebane mold. He played 13 games for New England last season and was part of the Patriots’ last-minute, goal-line stand in the 2014 Super Bowl, when an interception by CB Malcolm Butler denied the Seahawks a second consecutive championship. The 24-year-old Siliga, who played college ball at the University of Utah, was with the Seahawks briefly in 2013 after they acquired him from the Denver Broncos. Smith played 19 snaps against the Falcons after he was listed as questionable with an oblique injury. The Seahawks signed him Sept. 4 to add depth to the defensive line. DE Michael Bennett also had a knee injury Sunday when he was cut-blocked and didn’t play most of the second half. Carroll was more upbeat on his prognosis. As for SS Kam Chancellor, who missed the Atlanta game with a groin strain, Carroll described it as mild. The Seahawks (4-1) play Arizona (3-3), a 28-3 winner over the New York Jets Monday, at 5:30 p.m. Sunday at University of Phoenix Stadium (NBC). The Cardinals are two-point favorites. What a shame for Willson – Watching the replays it didn’t look possible he could have been injured. Amazing such little contact could be so damaging. Hope he gets back quick!